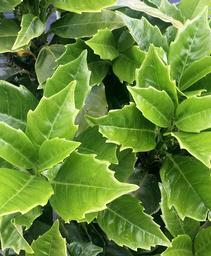 'Rozannie' Aucuba is a compact evergreen form which has large, very lustrous green leaves. They look almost artificial because they are so shiny and perfect. 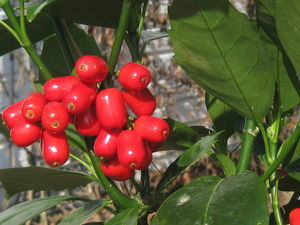 Even more amazing are the enormous bright red berries which remain on 'Rozannie' for several months. 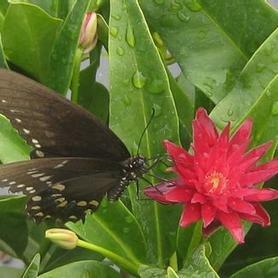 Since birds (and deer) do not eat the fruit, the show goes on for a long time. 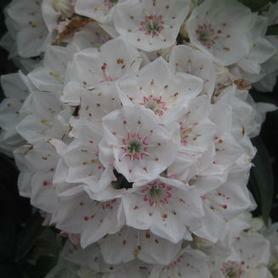 A compact female form, tolerant of a wide range of soils.